Almo Nature presents a holistic adult cat food. This dry food contains a high percentage of fresh fish or meat combined with rice, and all ingredients are natural. The meat is sourced from producers who rear their livestock organically (free of hormones and antibiotics during breeding), and the fish is freshly caught from the sea (no farmed fish). The ingredients of this holistic food are specially selected for their quality, and the fish and meat are rich in natural vitamins and minerals. Almo Nature never uses artificial preservatives, artificial colouring agents and/or other chemical additives, and products are always preserved naturally. This food is a healthy and conscientious choice for your cat, and is available in various flavours. It is recommended that you feed your cat a balanced diet of dry and canned food. 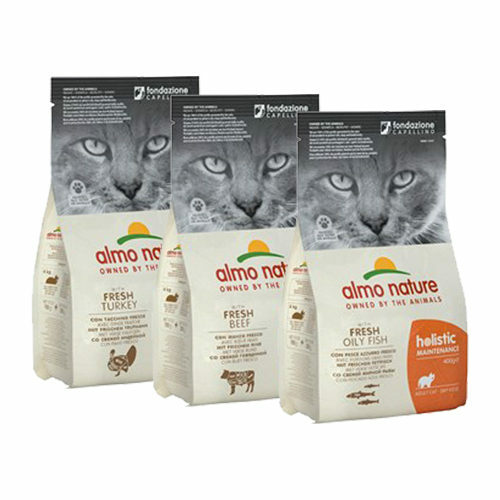 Almo Nature recommends giving your cat 60% wet food and 40% dry food each day for optimal nutritional balance. The chicken/rice and white fish/rice flavours of this holistic food are available in bags of 400 grams, 2 kg or 12 kg. Unfortunately, the turkey flavour is only available in 12 kg bags. Almo Nature has developed beautiful new packaging for many products. However, these are not yet available in all countries. You may, therefore, receive the product in the old packaging. Have you used Almo Nature - Holistic - Adult Cat food before? Let us know what you think about this product.